When the initial Guardians of the Galaxy came out there were no Baby Groot toys. Baby Groot was shown at the end of the film dancing and was so cute that it left many in the crowd wanting to find a toy version of the character. The final scene of Guardians of the Galaxy was kept secret enough that no toys had been planned for the character. This caused a massive cottage industry of people creating their own version of the character before Marvel and Toy makers could rush in and satiate demand. 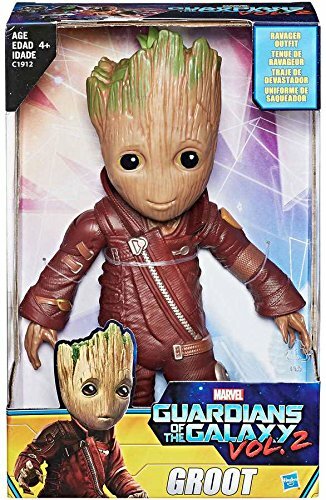 With Guardians of the Galaxy Vol 2 Marvel was not going to make the same mistake twice and there are now many different options of baby Groot at different price ranges. Toylab has rushed to find the coolest version of Baby Groot and where possible we have also included direct links to the best deals on Amazon. This is the versionof the character where he is in a pot and growing back. This is how the character appeared at the end of Guardians of the Galaxy 1. In Volume 2 he has continued to grow and has legs and so he has left the pot behind. This is one of the top selling Groot figures right now and I think its because it captures so much of young Groot's attitude. It also has a great price. This is likely the best value of all Groot figures. This is actually my current favorite Baby Groot figure but does cost almost double what the Funko figures cost. This has Baby Groot looking almost exactly like what he looks like in the film and with a Ravager uniform. He is also pretty much to scale with how he appears in the film. I would say the only version that is better than this is the Hot Toys version. The Hot Toys version was more real looking but this version is actually easier for a child to play with and for a collector to pose. This set is not a figure but is also really cool for a Groot Fan. It includes a Groot Body Knocker, Groot Ear Buds, and Groot scales. Everyone who sees the movie Guardians of the Galaxy leaves the theater with one overwhelming desire! How do I get my hands on a dancing baby Groot in a pot? Sure there are a lot of great Guardians of the Galaxy Merchandise but something about that cute little guy dancing in the pot sticks out. It seems that this simple want is not that easy to come by. Marvel it seems did not predict the demand for potted Groots and there is of now NO official potted Groot. Executive Editorial Director of Digital Media at Marvel Ryan Penagos has said on Twitter that while there has been talk of a toy there is still nothing official. I think the scene with the dancing Groot was added somewhat late and this could be why no one in merchandising at Marvel realized the potential of such a product. Now just because there is not official toys does not mean you can not buy one. Likely the most popular will be this one from Etsy. However, Marvel has now asked Etsy to stop selling these toys. So the only place to pick up one of them may be through Ebay. Sabrefiretiger is making custom Baby Groots for about $90 out of the funko pop toys. Hot Toys initially required you to buy a Groot and Rocket statue to get a potted Groot. Now they have this great new option of a $45 Baby Dancing Groot! I will keep my ear to the ground if other options become available. Also anyone with other ideas on how to make a baby groot or buy one please let me know in the comments section below.